The NRA Intercollegiate Pistol Championships will be hosted March 15-19 by the USAMU in Ft. Benning, Georgia. The event will determine the National Collegiate Individual and Team Champions for 2011 in the categories of Free Pistol, Standard Pistol, Open Air Pistol, Women’s Air Pistol and Women’s Sport Pistol. ROTC teams participating are invited only for Standard Pistol disciplines. To receive invitations to the Championships, shooters had to achieve qualifying scores in the annual NRA Intercollegiate Pistol Sectionals held throughout the U.S. in January and February. 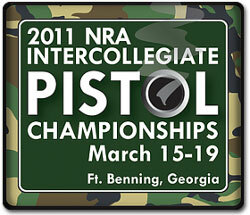 Visit the NRA Intercollegiate Pistol Championships website to learn more about the 2011 Championships. Prior to the Championships, on March 11-12, the Steel Challenge Shooting Association (SCSA) will conduct a free Scholastic Steel Challenge demonstration at Ft. Benning. This is the second demonstration event that the USAMU has hosted for the youth shooting program. The demonstration will feature two Steel Challenge stages: Smoke & Hope and Roundabout. The free shooting demonstration will take place from 9:00 am to 4:00 pm on Friday and Saturday, March 11 and 12 on the Parks Range at Ft. Benning. Handguns and ammunition will be provided. Share the post "2011 NRA Intercollegiate Pistol Championships"